The Great Famine or the Great Hunger (Irish: An Gorta Mór or An Drochshaol) is the name given to the famine in Ireland between 1845 and 1852. Outside Ireland, it is usually called the Irish Potato Famine. The famine was caused by "the potato blight", a fungus-like organism which quickly destroyed the potatoes in Ireland, and throughout Europe. The effect was particularly severe in Ireland because potatoes were the main source of food for most Irish people at the time. It is believed that between 500,000 and more than one million people died in the three years from 1846 to 1849 because of hunger or disease. Another million became refugees because of the famine. 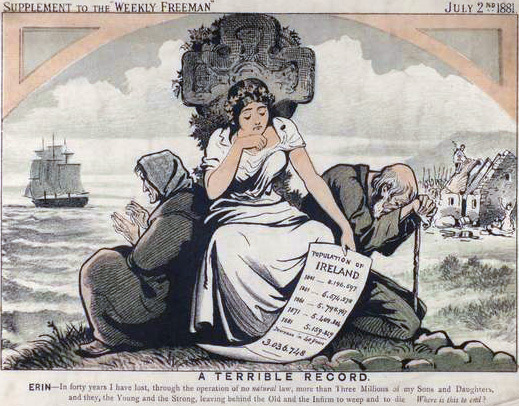 Many people who left Ireland moved to Great Britain, the United States, Canada and Australia. In Ireland this time is referred to as "the starvation". The potato was the only crop affected, yet Ireland continued to produce corn, wheat, barley, and beef. However, the mostly English landlords made a bigger profit by selling these food products elsewhere. By the late 17th century, potato had become common as a supplementary rather than a major food. The diet was mainly around butter, milk, and grain products. Potato became a base food of the poor, especially in winter. The lack of genetic variability among the potato plants in Ireland caused the emergence of Phytophthora infestans which had devastating effects in Ireland. Another factor is that holdings were so small that no crop other than potatoes would be able to feed a family. Starting in 1801, Ireland had been directly governed, under the Act of Union, as part of the United Kingdom. In the 40 years after the union, British governments grappled with the problems of governing the country. One historian calculated that, between 1801 and 1845, there had been 114 commissions and 61 special committees enquiring into the state of Ireland. "Without exception their findings prophesied disaster. Ireland was on the verge of starvation, her population rapidly increasing, three-quarters of her labourers unemployed, housing conditions appalling and the standard of living unbelievably low". 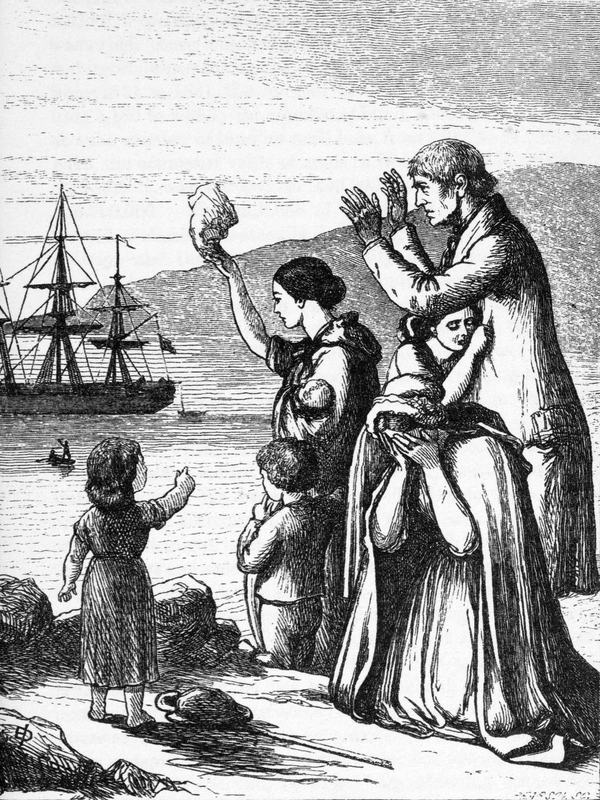 Irish Potato Famine Facts for Kids. Kiddle Encyclopedia.